Even though I had watched the ballot papers pile up in my tray at the count, I was still stunned to find we had secured 67% of the vote to hold the ward of East Brighton in the Brighton and Hove City council by-election on 8th February. Here’s how it happened. We’ve had more than our fair share of by-elections in this ward and although it is traditionally Labour, we never take that for granted – despite what the Lib Dem leaflets say. We always get out and campaign as if it was a marginal seat. We know where our vote is and the high number of postal voters gives us more time to get out the vote. In a winter by-election, we expected to struggle with turnout, but that went up and all the other parties lost votes to us. Some mums outside the school gates told us they voted for the first time in 2017 to get a Labour MP – “it worked,” they said, “so we’re all going to do it again”. East Brighton ward is in the Brighton Kemptown constituency where I stood as the parliamentary candidate in 2015. We ran a campaign up to May 2015 that focused on canvassing, direct mails and media work – it was all about name recognition. That hard work paid off this year and Labour members said that people felt like they knew me. In this ward, we don’t hear “you only come around at election time” – in fact, we door knock so often, we have a sneaky feeling that people leave their Labour posters up for a quieter life. The other two Labour councillors are well-known and have a consistent presence at community meetings. Throughout last summer, the team erected a gazebo on one of the estates where people often feel quite isolated; eventually people came over to chat and got to know us. Labour members volunteer in community cafés and we meet up in them so we bring in business. We talk to people in launderettes, at bus stops, outside schools and in the street – we go to where people are. We pick up issues, solve problems and get back to people – it all adds up and it’s a team effort. We were able to point to concrete achievements our Labour-led council has delivered, including new council homes and our successful fundraising to restore Madeira Terraces on the seafront. Both initiatives were very popular with local residents. We campaigned on what we were going to deliver in the future – regeneration projects and more housing. We came out fighting on the side of the people that live here – to save their bus services and community facilities. People told me they liked how positive and upbeat we were, they liked that we went and spoke to them in person. 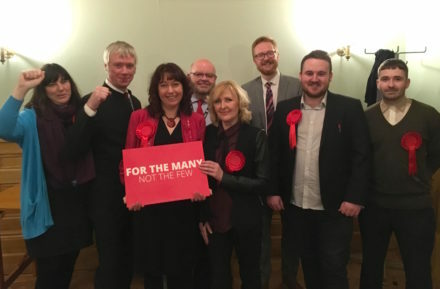 We rose above the Twitter spats and invitations to criticise other candidates – this campaign was about Labour and the community, because that’s what mattered. Rumours abound about Labour’s political differences in Brighton and will probably continue because some don’t want to let the truth get in the way of a good story. However, the reality is that all flavours of Labour came out to help and campaign together and we were united. Certainly, the only frustration I witnessed was the poor committee room co-ordinator who had to keep breaking up the party in ‘Barbara’s kitchen café’ on election day. The huge vote share and higher turnout also reflected the mood of voters. People are fed up with austerity and now know it is a political choice rather than an economic necessity. They have heard what Jeremy Corbyn has to say and he has given them hope for a different future under Labour. They want to hear us speaking out and fighting to save their services. With wages stagnating and the cost of living soaring, people’s services and quality of life is being driven down. Hope is needed now more than ever. Nancy Platts is a Labour councillor in East Brighton and a former advisor to Jeremy Corbyn.